At Langaro we believe every spa experience should be viewed as a treatment, not a treat. every spa therapist is trained to provide a personalised facials, full body massage, body wrap and body mask treatment, targeting your immediate needs. Make sure you advise your therapist if you are pregnant before booking your treatment. Wonderful massages that combine the properties of the ingredients used, with the most relaxing movements, managing to restore the physical and emotional balance of the body, mind and spirit. A completely indulgent back, neck and shoulder body massage using our award-winning Omega-rich oils to deeply relax and restore your tired skin and muscles. A medium pressure, relaxing massage. Great for stress relief and muscle tension. A physically relaxing massage using heated stones, placed on strategic pressure points throughout the body. Providing an experience that will ensure the deepest relaxation to ease achy muscles and relieve tension. Our signature treatments are designed to relax, invigorate and restore your energy for a new you. Using Aromatherapy combined with an exclusive massage technique for a deeply relaxing sensation. Includes a massage and a comfort zone tranquility facial experience. Indulge yourself with our invigorating & hydrating full body exfoliation or relax and restore your energy with a soothing vanilla bath treatment. Perfect before and after an indulgent full body massage. 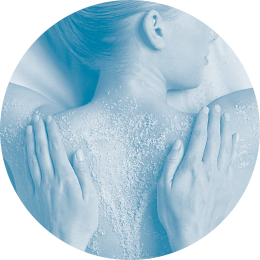 A Langaro body experience is a great way to rejuvenate, detoxify, and invigorate the skin. Is it not time you experience these skin benefits not just on the face but all over the body. Terres D’Afrique Shea butter melts to golden oil, unimaginably rich and generous to the skin. A slow, deep-massaging action results in a profound relaxation. While the essential fatty acids and vitamins re-hydrate recondition and revitalize your body from head to toe. After a gentle exfoliation, your skin is ready for the moisturising and healing of the rich Terres d’Afrique Omumbiri Body Butter. Rediscover skin that is smooth and soft to the touch. Radiant and glowing to the eyes. Skin that feels as good as it looks. Luxurious and pampering full body rituals combining light touch, African comb & crystals. in this unique body mask, reduce the negative effects of free radicals and inflammation. Helping to prevent the signs of age leaving their mark on your body. The lifting and firming properties of Kigelia, long known and treasured by the Tsonga women of Southern Africa, give this Body Mask its potency. Enhanced by Baobab and Rooibos, extracts of Kigelia help restore the skin’s elasticity, even out skin tones and reduce sunspots. Let us create the Ultimate Experience for you at Langaro. Time is a precious commodity and you should be able to choose how you would like to RELAX, REJUVENATE, TREAT or UPLIFT yourself for the day. All experience treatments include a complimentary snack and beverage for you to enjoy. Nothing is better then spending some quality time with your special someone. Create the ultimate package together and allow yourselves to be submerged in the ultimate luxury with us. All experience treatments include a complimentary snack and beverage for the both of you to enjoy. Having a baby is a stressful business, both physically and mentally. It is the perfect time for a girl to check out of reality and into a spa. Mama's Touch™ is our special programme of skin salvation; indulgent spa treatments designed to take you right through every stage of your nine month stretch and beyond. Remember, take good care of yourself and find joy in your amazing achievement. While you sit back and relax, we massage your hands and cuticles too. They don’t call it a maternity marathon for nothing.